Like most other noodle-based soups, phở can get soggy if everything is packed together in the same container. 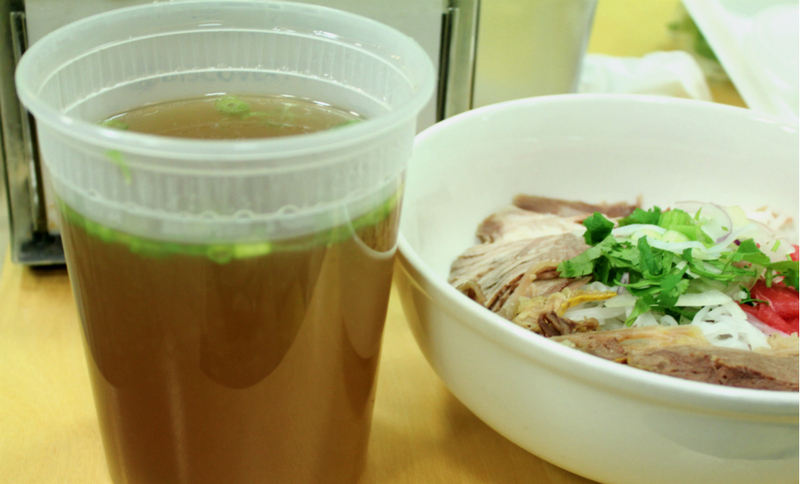 But that doesn’t mean you can’t enjoy a fresh, bouncy-noodled bowl of phở to go! 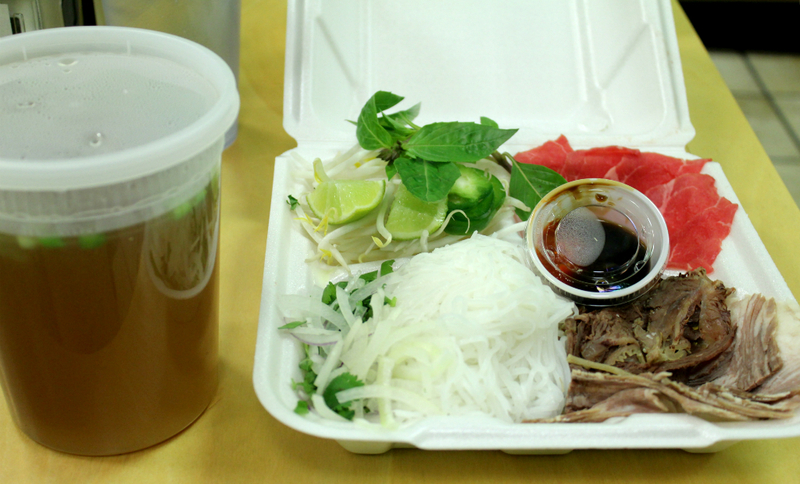 In this guide, we will break down how to assemble our to-go boxes at Phở 83 into a scrumptious meal. Remember, as with everything to do with phở, pretty much everything can be changed to your taste; you may prefer to layer the ingredients in a different order, and there’s nothing wrong with that. These are just our recommended steps! 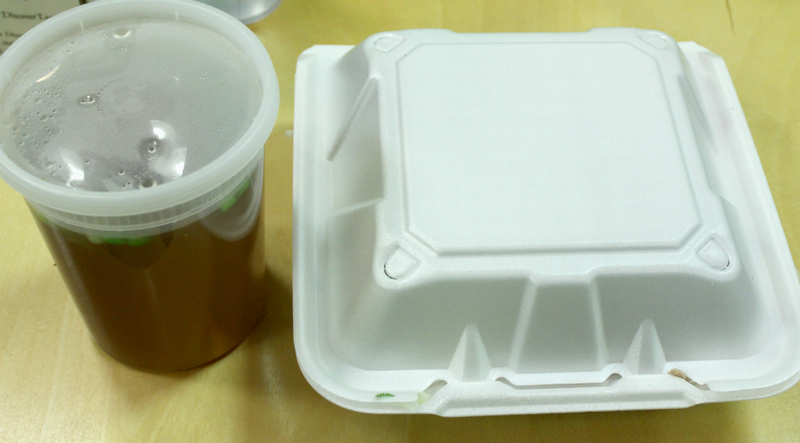 To the left is a quart of hot steaming phở broth with scallions, which comes with our large size soups. Yummy! In the top left compartment of the box is an assortment of fresh veggies: bean sprouts, limes, Thai basil, and jalapeño slices. These are part of your garnishes. In the top right compartment of the box are a few slices of tái meat (eye round steak). If it looks a little uncooked to you, you’re not wrong! 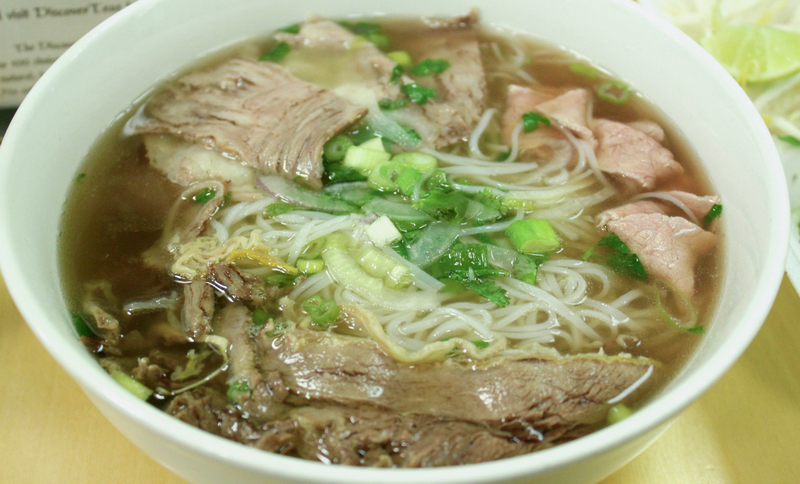 The traditional method of eating phở is to dunk the tái into the broth to cook just before serving so it stays tender. If you’re uncomfortable with this, just ask us to cook it to done prior to boxing it up when you call in your order at Phở 83. In the bottom far left of the box, we have the onions and cilantro. These are the rest of your garnishes. In the middle of the bottom compartment of the box, we have your phở noodles. In the bottom right of the box, we have the other cuts of meat you ordered with your phở. For an idea of how large our serving sizes are, the photos in this guide were taken with a large size phở. And finally, a little off center, there is a little cup of Sriracha sauce and hoisin sauce. The Sriracha chili garlic sauce is the red, and along with the optional jalapeño slices, is the only part of the meal that is spicy. The hoisin sauce is dark brown and a good sweet and savory accent. These are our condiments. Now that we’ve got the introductions settled, let’s go over assembly. 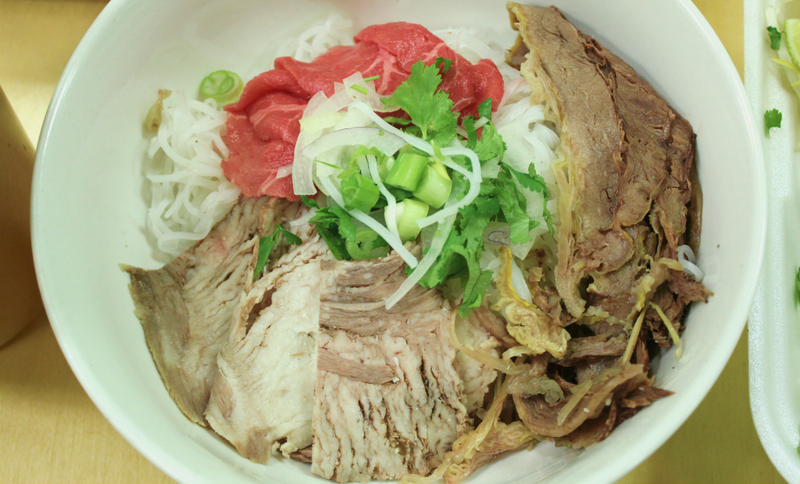 When ordering take-out, we recommend you have a large bowl on hand for your phở. If that’s impossible, you can assemble in the broth container, but be very careful, as that can get very messy! When using a bowl, we recommend you start by adding the noodles first. Go ahead and add your onions and cilantro. If you’re not a fan of those, you don’t have to add them; if you prefer to add them after the broth, you can do that, too—that’s the beauty of phở! Step 5. Fill ‘er Up! Pour your broth over the phở. If it’s been a while since you received your to-go order, make sure to heat up the broth on the stove or in the microwave first so that it’s piping hot and will cook the tái meat through faster. See how fast the tái cooks? If the broth is hot, it doesn’t take very long. If you like, you can push the meat deeper into the hot broth with your chopsticks or fork to make it cook faster. As we’ve said earlier, one of the beautiful things about phở is that you’re encouraged to customize it to your preferences. Remember those condiments and garnishes we mentioned earlier? Now is the time to add them―or not, depending on your tastes! If you like your food spicy, you may want to add plenty of Sriracha and jalapeño; otherwise, just steer clear. Want to add some sweeter savor to the broth? Add some hoisin sauce. For those who enjoy a touch of bright tartness, squeezing fresh lime juice might be the way to go. Mix it all in until it matches your cravings. 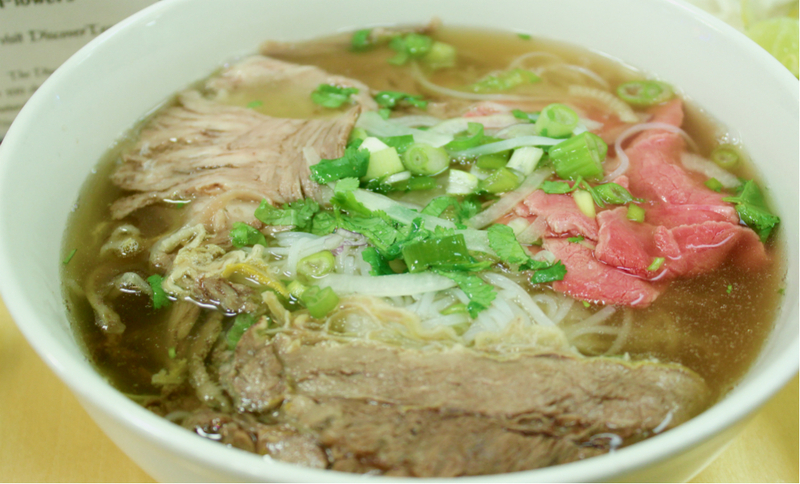 In the end, we believe that at Phở 83, the best bowl of phở is the one you love making for yourself. What’s your favorite way to phở?